OWFI hereby reaches out to every woman detained or exploited by the criminal organization of ISIS in Mosul, Telafar, Sinjar, as well as the Western cities of Iraq. The OWFI stands with you and strives to provide logistic and financial support to you in order that you escape your concentration camps controlled by ISIS. The OWFI will send individuals who can help you to arrive at our safe home in Baghdad where we provide you with all the care and safety you need. 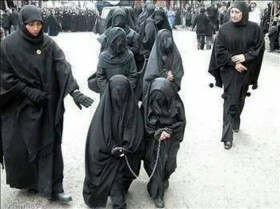 To all women chained and detained by ISIS slave-drivers, to all women who are forced to hide in their homes, to girls who aspire to live in freedom and dignity, and to all Yazidi women and Turkomen Telafar women, contact OWFI at the numbers listed above and they will find a way to deliver financial and logistic support to get you to our houses safely. We beg you not to end your life or undervalue it in any way, or surrender to despair as a result of heavy torture or humiliation under the hands of ISIS criminals. Tomorrow brings hope with, and after every storm comes sunshine. Long live Yazidi, Christian, Talafer, and Amerli women, in freedom and dignity. Down with the ISIS monsters.